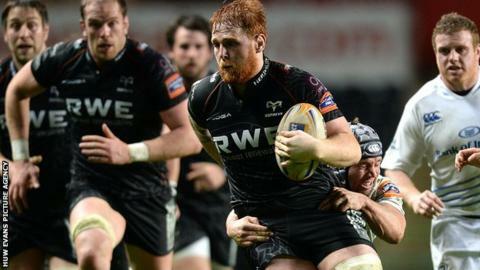 Number eight Dan Baker is in contention to make Wales' summer tour to South Africa, says Ospreys coach Steve Tandy. The 21-year-old has produced a string of impressive performances for the Ospreys and has emerged as a candidate for the three-match tour. Tandy believes the twice-capped Wales international could tour as the deputy to the first-choice number eight, British and Irish Lion Taulupe Faletau. "There is real potential that Dan will go to South Africa," said Tandy. "If he keeps performing the way he has done over the last couple of weeks then I am sure he is contention." Baker produced a man-of-the-match display in the Ospreys' 25-19 win against Pro12 leaders Leinster at the Liberty Stadium. The 6ft 3in back-row was selected for Wales' summer tour of Japan in 2013 and made his debut as a replacement in the 22-18 win in the first Test in Osaka. Baker also came off the bench for the second Test in Wales' first historic defeat to Japan in Tokyo. He is now in the frame for a place in Warren Gatland's Wales squad for the summer tour and has a chance to impress the New Zealander at the Millennium Stadium on Sunday. The Ospreys face the Newport Gwent Dragons in the second game of the regional double-header and will lock horns with Faletau. Tandy says Baker still has a lot to learn but is looking forward to seeing how the Ospreys youngster fares against the Lions number eight. "There will be a lot of good competition throughout the game, but Dan is starting on the road while Toby is pretty far down the track in fairness," said Tandy. "He is a world-class number eight, while Dan has put in some decent performances and cannot get too carried away with it. "We don't want to blow him up too much at the minute but he is performing really well for us." Who are Wales' new boys in Japan? Read more on Who are Wales' new boys in Japan?